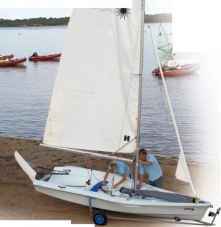 Every dinghy is rigged in a slightly different way and you should familiarize yourself with the manufacturer's instructions for the dinghy you are handling. 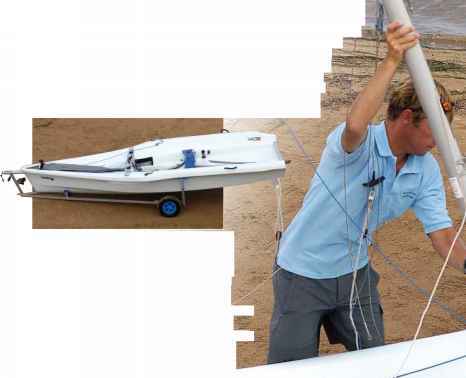 The rigging sequence shown here is an example of how to rig a typical two-handed dinghy. select a flat location with the dinghy parked securely on its trailer and sufficient space all around. Check for overhead cables and other obstructions. Lay out the mast, boom, and rigging components. The mast may be fitted with a separate wire forestay to attach to the bow; on dinghies with roller furling systems the forestay is provided by a luff wire built into the jib. If there is no conventional forestay, attach a rope temporarily. 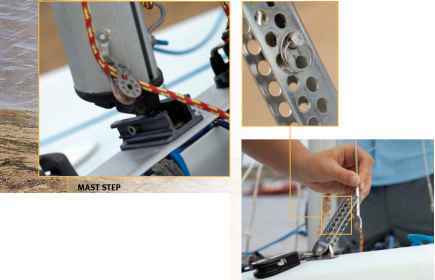 Ensure that each wire is led separately to the base of the mast with no kinks or tangles. Cover securely with tape any pins and rings which could catch on the spinnaker. Halyards for mainsail, jib, and spinnaker should all be fitted and secured by knots, along with a burgee or wind indicator, before raising the mast. 1 Prepare the dinghy for rigging on its trailer or dolly, with clearworking space all around. When possible, choose a day with light wind. Two people are needed to rig the boat. One person lifts the mast vertically and locates it in the mast step, while the other person is ready to attach the two shrouds that support it. In light wind, a small aluminum mast can be lifted to a vertical position by one person. On some dinghies, before raising the mast, it is normal to attach the shrouds to the shroud plates on the hull with the mast laid horizontally along the boat. The mast is then lifted so that the base fits into the mast step, letting it lean forward, while you attach the forestay to the bows. On the Laser Vago shown here, one person lifts and supports the mast in its final position, while the other person fixes it into the mast step and attaches shrouds and forestay to their fixing points on the hull. A clevis pin and split ring are used to secure shrouds and other fittings. Beware that split rings can be tricky. They are easily dropped and lost. The heel of the mast fits into the mast step, where it straddles a bolt that holds it securely in position. 3 Shroud plates attached to the hull allow shroud length to be adjusted with a pin and ring system. A dinghy's rigging manual will recommend which hole to use. 4 A length of rope secures the wire forestay temporarily to the roller-furler mechanism. This is removed when the jib is rigged. Many modern two-handed dinghies have roller-furling jibs, which can remain rigged throughout the sailing season. The jib luff wire forms the forestay that supports the mast. A cover can be used to protect the furled sail from damage from sunlight when the dinghy is not in use. Wind the furling line fully on to the drum, before attaching the tack of the jib, and lead the line back to the cockpit. Attach the furling swivel firmly to the end of the halyard with a shackle. Have the rolled jib ready for hoisting, neatly laid along the boat, tack foremost. IWith a rope forestay holding the mast, attach the tack of the jib to the roller furling drum. Attach the head of the jib to the roller furling swivel on the jib halyard. 2 Pull the wire jib halyard down from the back of the mast. When it is fairly tight, hook the tensioning block on to the wire loop. 3 Pull down on the halyard tension control rope until the luff of the jib is taut. On some dinghies, a lever is used to apply final tension to the luff of the jib. With the luff wire of the jib now providing the forestay, stow the temporary forestay alongside the mast. Attach the sheets to the clew of the jib using stopper knots. Attach sheets to the clew with figure-of-eight knots (see p.88) on either side of the cringle (reinforced eye). The boom provides longitudinal tension in the mainsail, with an adjustable outhaul pulling the clew towards the end of the boom. 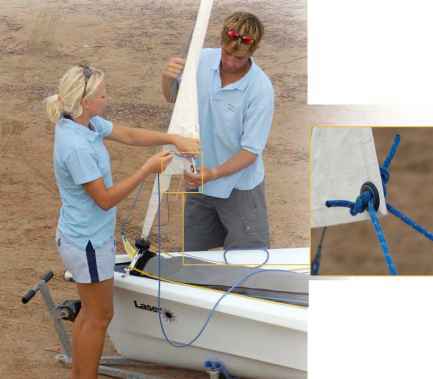 To prevent the boom from lifting when the wind fills the sail, in most boats there is a multi-purchase adjustable rope kicking strap ("kicker") or aluminum boom vang. A gnav is an upside-down vang, on top of the boom. Pulling forward the base of the aluminum strut presses the boom down. 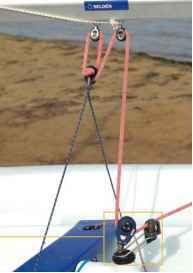 An articulated joint connects the swinging boom to the mast. ITwo people are required to fit the boom and gnav to the mast. Despite the extra fiddling, a gnav has the advantage of freeing up space under the boom, with less danger of the crew getting trapped by the kicker during a tack or jibe. 2 Articulated joints link the gnav between the mast and a slider on the boom. A multi-purchase control line pulls the slider forward to push down the boom and tension the mainsail. A figure-eight stopper knot (see p.88) is tied at the end of the mainsheet. 3 the mainsheet (red) is threaded through blocks to the main jamming cleat, which allows you to lock or unlock the mainsheet. The top blocks are attached to a bridle rope (blue) which lets them move from side to side. Hoist sails with the dinghy head to wind. Always hoist the mainsail with the bow of the dinghy facing into the wind. A sail flapping in a sideways breeze is both dangerous and very difficult to hoist. Do it as close to the water as possible, so you don't have to push the boat too far on its trolley with the mainsail raised. If you have to alter direction and get side-on to the wind, the boat may blow over. If you are sailing where there is no beach, launch the dinghy and moor it alongside the pontoon with the bow into the wind. If the wind is moderate or fresh, postpone hoisting the mainsail until you are ready to go sailing and intend to launch almost straightaway. The mainsail can be hoisted ahead of time in light winds, but you should not leave the boat unattended in case of changes in wind direction or strength. Fit the tack slider into th e outer end of the groove in the boom and pull it all the way along the boom towards the mast. Feed the clew outhaul line through the cringle to control tension in the foot of the sail. Then lead it forward along the boom and cleat it. 3 Attach the halyard to th e head of the sail. Push the rope through the cringle to form a loop and lock it in place with the bobble. One person should feed the bolt rope into the luff groove at the base of the mast. It may may be quite tricky to slide it in. 4 For the hoist, two people need to work together. One pulls on the halyard while the other feeds the bolt rope into the luff groove. The rudder stock is fitted to the transom "gudgeon" with a "pintle"; these together form a hinge by which the rudder can be raised or lowered during sailing. To prevent the rudder falling off during a capsize, a spring clip or retaining split pin (as shown here) is fitted to hold it in place. Align each pintle with a gudgeon on the transom. This can be tricky to do if the boat is afloat. With the pintles in place, make sure the rudder is locked onto the transom by a clip or retaining pin. The boat is fully rigged and ready to go. This is the time to make a decision about whether it's necessary to reef the mainsail. If the wind is strong, you may choose reduce the size of the mainsail by reefing. This is not possible on all dinghies, but the system shown here is known as "slab reefing", with an equal amount of sail pulled down at the luff and the leech. 1 Reefing must be done with the bow of the boat facing into the wind. Start by attaching a reefing line to the reefing cringles at the luff of the sail, then lead it down to a cleat on the boom. 2 You will find parallel reefing cringles at the leech of the sail. Fit another reefing line here and lead it down to the boom. 3 Ease off the halyard and secure it loosely while you pull luff and leech reefing cringles down on to the boom, then re-tension the halyard. Here, a single reefing line pulls down both sides of the sail simultaneously. The excess sail is gathered neatly on the boom. How to rig furler for dinghy?